The technique of static delegate substitution is simply strange and requires too much thinking / analysis for good maintenance. The unit tests are brittle, often failing on the first try due to multiple tests interacting with each other as they replace the static delegate. Interestingly, I’ve found the second to be true with both XUnit and NUnit, even when supposedly running tests serially. This problem did not occur as frequently when I first started using the technique five years ago; I was using VS Tests or NUnit 2 back then, so perhaps the more recent brittleness is from the change in frameworks. For a large set of extension methods over unmockable code - for example extension methods around database interaction - best to go ahead and create a thin adapter layer with an interface and constructor injection. For a small static method over unmockable code, consider a small class with optional interface for either constructor or property injection. If tempted to introduce a global static for any reason, consider instead using of these two techniques. The brittle unit tests were getting beyond annoying, so recently I finally changed this to wrap this single command in a utility class. To prevent breaking every unit test through introduction of a new constructor argument, I used property injection: thus only the unit tests that needed to mock this method would need to inject a replacement. I didn’t even bother adding an interface, knowing that I could use Mock to replace this virtual method. This fixed the brittle test problem nicely. However, it leaves in place a glaringly-obvious problem: this base class is tainted by presence of Entity Framework! The FlightNode project was an after hours project with no one to review the code, one that an external organization was dependent on. In hindsight I see that I got sloppy here in my haste to deliver the code on a seasonally-relevant roadmap. The IPersistenceBase should have hidden the state modification. We just wrapped up the 2018 Technical Bootcamp as part of the Ed-Fi Summit. The Bootcamp is a two-day event where we dig into the technical details, provide hands-on training and demonstrations, and get feedback from the technical community on challenges they’d like to address and improvements they’d like to see made. We had a number of sessions geared specifically toward local education agencies (LEA), state education agencies (SEA), and vendors. Have you ever tried to write a query using the Ed-Fi ODS for reporting or analytics? To say that it is challenging is to use the mildest language. The Data Standard documentation in Tech Docs is top notch. Nevertheless, going from diagrams and definitions to actual query code for, let’s say, each student’s average math grade during a grading period, is not a trivial exercise. Continuing from Upgrading safnet-directory, part 1, it is time to improve the solution’s unit testing. At the outset, the controllers cannot be unit tested effectively due to their direct dependence on Entity Framework and ASP.NET Identity Framework classes. With application of an in-memory database, they could be integration tested, but not unit tested as I understand and apply the term. Given that there is no significant business logic in this application, new code in the middle layer is not worth the effort. But I will extract a simple data layer. It will not be as comprehensive an interface as I would make in a larger app, but it will be effective in isolating the Controllers from Entity Framework. ASP.NET Identity classes are already encapsulating logic around authentication, and they can remain - so long as they have proper interfaces and can be injected into controllers. For dependency injection, I know that ASP.NET Core (coming in a future article) has its own good system. I have heard kind words spoken about Simple Injector but never tried it out before. On the MVC-side of the house, I was using Owin as a cheap dependency manager for authentication with ASP.NET Identity framework. I will leave this alone for the moment, since that will likely require more radical change in the .NET Core future anyway. The members of the IDbContext were easy to identify, based on how the Controllers were using ApplicationDbContext. One of those members returns an IQueryable. For unit testing, I need to be able to mock it. MockQueryable will do nicely. It seems that it is also time to Install my preferred unit testing tools, NUnit 3 and FluentAssertions. At last it is possible to fully unit test this class: the database connection has been mocked and the tests can control the user’s claimset. What about the other classes? There are some that will never be tested - e.g. the database migration classes and the data context class; these should be decorated with [ExcludeFromCodeCoverage]. 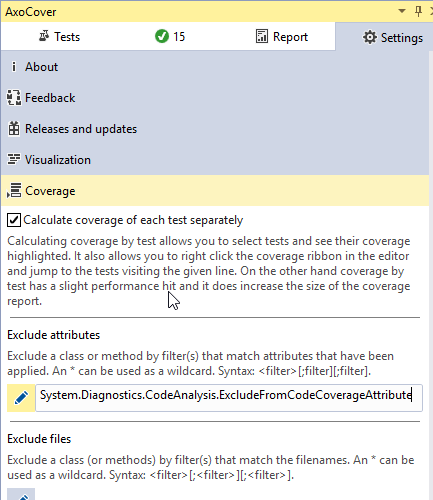 It would be nice to find out what my code coverage is. Without Visual Studio Enterprise or DotCover we need to turn to OpenCover. 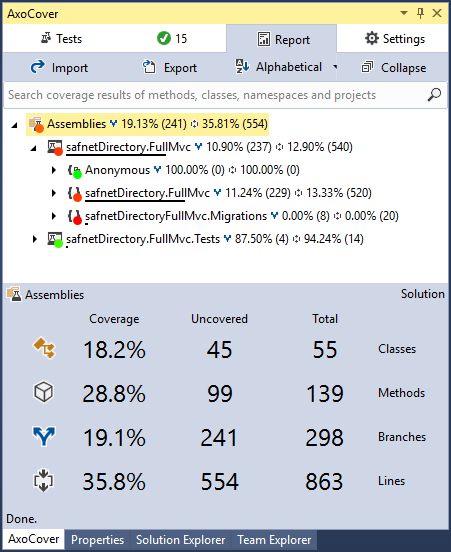 Let’s try AxoCover for integrating OpenCover into Visual Studio. Exclude ASP.NET configuration classes - is there really value in unit testing BundleConfig, FilgerConfig, RouteConfig, or Startup? In addition, there are some unused methods related to two-factor authentication that can be removed from both the Identity management code and from the MVC AccountController and ManageController. Eliminating unneeded code brought me up to 52.6% code coverage. Much of the uncovered code is related to ASP.NET Identity, and I suspect that code will change significantly in the upgrade to ASP.NET Core. Perhaps it is not worth taking the time to fill in missing unit tests for those methods and classes right now. Sole remaining focus for unit testing will be the EmployeeController - bringing it, at least, to 100% coverage. Full file diffs in pull request 2. In 2014 I built a quick-and-dirty web application using ASP.NET MVC5 and AngularJS 1.0.2. There are probably millions of web applications, large and small, that are “stuck” on some older tech, often because people are afraid of the work it will take to modernize them. In this series of blog posts, I’ll refactor away the tech debt and polish it up this little app to make it something to be proud of… as much as one can be proud of a simplistic proof-of-concept, anyway. First up: basic and trivial cleanup of the solution, bringing it up to .NET 4.7.2. Future: improved testing; ASP.NET Core; Entity Framework Core and better separation of concerns; UI libraries / frameworks. All work in this and subsequent posts will be using Visual Studio 2017, git-bash, and other free tools. Long pascalCased names are not in favor any more. Snake case has become deservedly popular - it is easier to read. So let’s rename this project from safnetDirectory to safnet-directory. GitHub repo’s staying put though, out of laziness. In the early days, no doubt for what were at the time good reasons, Microsoft had us creating .nuget folders containing nuget.exe, nuget.config, and nuget.targets. Right around the time that I created this application, perhaps just afterward, Microsoft eliminated the need for it (check out the evolution of the Stack Overflow discussion). Not everyone is ready to commit to ASP.NET Core. For starters, let’s at least move it up from .NET 4.5 to .NET 4.7.2 and the latest versions of all NuGet dependencies. Really old code? Consider looking through the Migration Guide to the .NET Framework 4.7, 4.6, and 4.5. Run Code Analysis with Microsoft Managed Recommended Rules. This app is simple. Not surprisingly, there are no build errors or warnings. Now update all of the NuGet packages to the latest (not .NET Core / Standard) libraries (26 updates available!). Interestingly, it took four rounds of updates to get through everything. Did anything break? No build errors, warnings, or messages. But some unit tests failed - because this was a quick-and-dirty application, and I didn’t have time to write them properly. The failed tests were actually integration tests and they depended on the state of the database. Before making more radical changes (.net core), I should fix up the test project. The API in this case was simply using MVC controllers and returning JSON, instead of using Web API. In ASP.NET COre the web libraries were merged into one framework instead of two. As the last step in this initial refactoring foray, I’ll convert the API endpoints to use Web API. Since I don’t have unit tests yet, I will not change the business logic in any way; only the method signatures and return statements should change. This way I don’t create unit tests for the old way and then modify them twice (once to Web API and once to APS.NET Core MVC). Change the return type from JsonResult to IHttpActionResult, without conversion to async (that can come with EF Core upgrade). There are a few other “API” methods in the HomeController, and of course I’ll move those over as well. And apply proper attributes (HttpGet, HttpPost, Authorize, FromBody, FromUri). All told, it is a quick and painless process - at least for an application of this size ;-). Well, not so quick… a few adjustments to be made in AngularJs as well. For starters, there’s the new routing for Employee CRUD operations. And, those operations will be using JSON instead of form encoding (that required custom code, which I now rip out). The URL I had defined in a global api object in _Layout.cshtml. For now I’ll leave it there and just update the routes. Finally, the search form was JSON-encoding an object and injecting that into the query string; that’s just weird and should be a plain query string, i.e. from &searchModel=%7B%22name%22%3A%22Stephen%22%2C%22title%22%3A%22%22%2C%22location%22%3A%22Austin%22%2C%22email%22%3A%22%22%7D to &name=Stephen&location=Austin for a search on the name and location properties. The application is nearly as fully functional as before, but the CSS is messed up. Perhaps because I accidentally upgraded to Bootstrap 4.1.1. Back to 3.3.7 now, as I am not ready for BS 4. Indeed, that fixed it. While I am at it, I might as well remove Modernizr and Respond - no need to support old browsers. Also messed up: the Edit Employee modal dialog doesn’t close on save, but rather throws a very obscure-looking AngularJS error. Going to upgrade the UI in the future and this is very old AngularJS (1.0.2), so I will ignore it for now. Full file diffs in pull request 1. It is 2018, and I have only just learned about the fantastic FluentAssertions framework. Seems like a nice time for a quick review of unit testing tools for .NET. Personal preferences: NUnit, FluentAssertions, Moq. MSTest, NUnit, XUnit - they are all useful. They are all well-integrated into Visual Studio now. I would not make a strong argument against any choice for a team that already knows the tool. For new development, I would unhesitatingly choose NUnit. I used XUnit for the FlightNode project. I enjoyed the flexibility with the assertion statements. I did not like the enforcement of only one assertion per unit test. The theory is that multiple assertions make it more difficult to know which thing failed (do yourself a favor and add a message in the assertion to solve this!) and you do not get verification on the assertions written below the one that failed. The latter is a valid point, but I have very rarely found this to be a problem in the real world. Ultimately, I ended up spending too much time writing method signatures and extracting shared functionality in the name of small tests with one assertion. I also found that my XUnit tests were hard to maintain as the style caused me to extract so much into private functions, thus reducing the readability of any individual test. MSTest at this point might be as good as NUnit - I have not investigated in a long time. The unit test first mentality of NUnit and its strong testing of exceptions and async make me a believer. Also, while Microsoft is a great company and all… I like promoting a diverse ecosystem. The assertion error messages are beautiful. The breadth and depth of the syntax is awe-inspiring. Message: Expected system.Body to be "hi", but found <null>. Moq is hands-down the winner. NSubstitute looks interesting and might be viable competition; however, it has been around for 8 years and personally I’ve never run into a project that uses it. RhinoMocks was great in its time, I’m sure, but the syntax is not as nice as Moq. And while the founder’s personal repository has had a handful of commits in recent years, the official repo hasn’t seen a commit since 2010 - whereas Moq is very much alive, with multiple releases in 2018. Ancient. And slow. Old code that still uses RhinoMocks should be updated. Looking back at FlightNode, I was confused by some code I wrote two years ago. What is this Fixture.Freeze code about? Apparently I have completely forgotten about AutoFixture. It was probably an interesting experiment. It may have even been beneficial. But I do not even know what’s going on when I look at my own tests. No doubt a quick review of AutoFixture’s documentation would suffice to bring me up to speed. At this moment, I have no argument for or against it. There is a positive a trend of developers doing more of their own testing, going beyond unit testing. However, if independent testers are cut out of the loop, then surely many applications will suffer. Case in point: a user unexpectedly entering a decimal temperatures and military time in a citizen science data collection application. The TERN data collection application supports the Texas Estuarine Research Network’s citizen science efforts on the Gulf coast of Texas and has been in operation since 2016. The code and testing were 99% all on my own, in spare time on weekends. I had tried to recruit some help with this open source project, but other than a couple of early code commits, I was unsuccessful in that regard. Recently I received a support request for an application error with no obvious explanation. No error log entry was written. Thankfully after a few e-mails, the user sent me a screenshot of the error and the form contents - and I noticed right away that she had entered a decimal temperature value. Decimal temperature values, regardless of the scale, seem quite reasonable. The problem is, in my personal data collection I always had whole integers. Thus it never occurred that decimal would be desired. The API expected an integer. The form field has a stepwise increment of integers, but the HTML numeric field type also happily accepts decimals. When the decimal was supplied, the WebAPI 2 application was actually throwing an error when trying to deserialize the data. Since this error is a bad request (user data), it was not logged (perhaps I should start logging BadRequests at the WARN level). Since decimal values are real-world legitimate, I changed the data type in the API and database, and now everything is fine. This user also had helpful input regarding time. 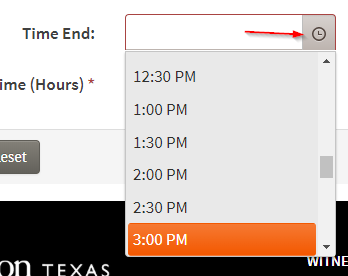 Many applications have drop-down menus for times, in 15 or 30 minute increments. I used the Kendo Time Picker control. Unlike some time controls, it doesn’t automatically drop the menu down - so you only know about it if you think to click the icon, which is not entirely intuitive. Once you do click on that, it can be a little confusing - are you allowed to type in your own, more precise, answer? I’ll need to do a little more research before deciding if/how to improve this. And what about military time, the user asked? Personally, I can’t recall ever doing data entry with military time, so again it didn’t occur to me to check on this. It turns out this control is smart in that regard - and so is the back-end API service. The system accepts military time. However, because of changes in format between Angular, Kendo, and .NET code, it ends up being translated back into standard(?) time. Hopefully this isn’t too confusing - but it is admittedly odd. In a more robust system, perhaps the user would be able to choose her global preference for which time display to use. Startup fresh virtual machines from a pre-created, Packer-based image in seconds instead of hours. Use the same scripts to create a local VM, a VWMARE instance, or a cloud-based virtual machine. Helps you maintain a strategy of infrastructure-as-code, which can be version-conrolled. While Packer can be combined with many other useful tools, at its heart it is a simple json template file that starts up a virtual machine, provisions it with files, and runs scripts on it. For a primarily-Windows shop, this means running Powershell scripts. In search of a light weight windows vagrant box by Matt Wrock has many interesting optimizations. Evaluate each option carefully to decide if it is right for you, and to decide which options should be used with which builders. For example, if building for a corporate IT environment, running standard Windows Update might not be appropriate - you may need to run a group policy to install only approved updates. Mr. Wrock has many great templates for creating vagrant boxes that leverage Packer; studying them can be of great benefit when learning how to employ Packer in your own environment. Another great collection to use or study: boxcutter’s Packer Templates for Windows. Best Practices with Packer and Windows lives up to its name and has a great Lego table-flip GIF. I particularly appreciated the suggestion of chaining multiple build templates together - although you do need to watch out for disk space consumption when you create multiple images, one building off of another. This article mentions running sysprep, a built-in Windows tool for genericizing a customized image. It does things like removing the Windows product key and other personalization settings. There may be a better way around it, but I’m not well-versed enough in Windows server setups to know how to avoid a pernicious little problem: if you chain multiple builds together with a typical sysprep configuration, then the second build will fail. It will be hung up on asking you to provide a product key! So I found it best to keep sysprep only in the final build in the chain. When running sysprep on AWS or Azure be sure to follow the specialized instructions for those environments (AWS, Azure). Do you trust that the download link will stay alive and not be hijacked? Depends on the source. If you don’t, then it might be useful to create your own mirror. Downloading from the Internet can be tricky as you might not want your image-in-creation to have full Internet access, or you might be running locally on a virtual switch that is “internal only”. You could put all of your files into an HTTP server that is local - on the computer that is running packer / packer.exe. This works for local images but not cloud-based images. Hybrid approach - inject a cloud-based URL for cloud-based image creation and a local URL for local image creation.